Survivors, survive. Some horribly, some magically. Some get help. Some are beyond repair. Our world doesn’t seem safer, doesn’t seem better run, but on the other hand I’m not clear it is worse. As voyeurs we’ve been neither slayed or maimed. Just numbed, desensitized, more aware, in-tune. Up to date. Is there value in that? Journalism and media don’t deliberately cause harm, but does our involvement, our awareness ‘as it happens’ prevent any? We all ‘lived the Arab-spring’ but did that live-streaming save lives or simply boost ratings – seriously, does anyone know? Is the world a better place than 15 years ago? Sure. Is it a safer world? Seems ‘they’ are keeping us safer – but foes of freedom seem to have access to funding and technology improvements too. Are our governments, intelligence agencies, armies and police any better at preventing? Does our future hold some peace, or some piece of mind? Probably not enough of either. 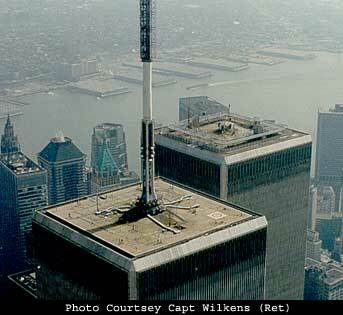 I recall vividly, each of my trips to New York with my daughters – we went to a place many tourists were unaware of, to the roof the south tower of the World Trade Center (north tower was the one with that monstrous antennae). There was square catwalk, safe and sturdy – you bounced a bit when you walked on it. We were told the antennae’s primary purpose was to communicate with ships at sea. We looked out, and down on Manhattan – surreal site, being at such a high-point, those mere 50 and 60 story buildings below, like toy-miniatures. On my recent trip to Washington I visited Newseum – where a piece of that antennae recovered from the site is displayed. Simple piece of mangled scrap iron – brought back memories of 15 years ago, of course, but also memories of catwalk visits with adolescents. They were wide-eyed and amazed – like me. I was showing them something I’d seen before. I’ve never regretted those visits to the top of the world. We understand wars of all kinds leave scars of all kinds – some die tragically, some quickly, some agonizingly slow. We don’t know this, but we hear it, read it and attempt to understand it. Maybe we get over it. morning walk with Gusta: 6C/43F, raining overnight … still raining, calm, green leaves look happy but their yellow and orange cousins are on the ground. Gusta loves the rain. Me, not so much. It was a short walk!